The Carlton GT2 feather shuttlecock is amongst the most advanced shuttles available on the market today. With high resilience, high grade premium density cork and made of high grade goose feather, the GT2 offers true flight and dependable performance. The GT2 feather shuttle also has a unique Nano film durability coating applied to the feather to add greater resilience to the shuttles. for submitting product information about Carlton GT2 - Feather Shuttlecock We aim to answer all questions within 2-3 days. 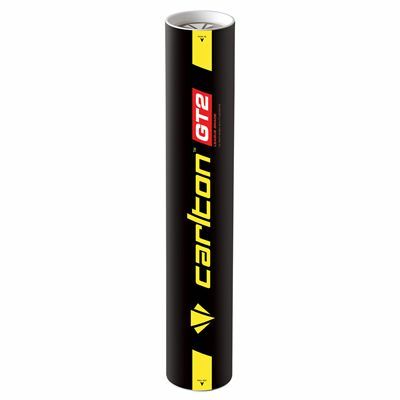 for submitting product information about Carlton GT2 - Feather Shuttlecock. We aim to answer all questions within 2-3 days. If you provided your name and email address, we will email you as soon as the answer is published. Nice flight and good speed. I would have been much happier if they lasted a little longer, but that is probably we are casual players! for submitting product review about Carlton GT2 - Feather Shuttlecock.